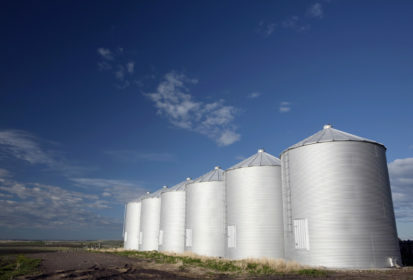 Is it worthwhile to store your grain on the farm while you wait for commodity prices to rise? Storing grain on the farm can be a good marketing strategy because, if managed carefully, it can increase a producer’s profits, but it’s important to have a handle on your storage and opportunity costs to assess if it’s actually going to put money in the bank. The capital costs of storage vary depending on whether you have adequate storage capacity or need to add more, and the type of storage you elect to use — whether it’s a temporary system such as grain bagging or a permanent, fixed, metal structure. A recent Alberta Government report estimates that grain storage costs can vary anywhere from $0.18 per bushel to more than $4.50/bu. Obviously, the longer you store grain, the greater the accumulated storage cost, and it will vary depending on your type and size of storage, financing arrangements and depreciation. Even if you have sufficient storage, or you have finished paying for a new bin, the cost is not zero. You also need to factor in the costs of aeration, repairs, maintenance and additional handling. Canola prices — or at least basis levels — typically improve as the marketing year progresses. Prices are more volatile in the spring because of uncertainty about the new crop acres that will be seeded and how much will be available in the market. So it’s important to do some market analysis to try and decide, from year to year, which crops are most likely to benefit from storage. There is always the risk of course, that prices could fall. Even if prices stay at the same level, both the cost of storage and your opportunity cost reduce the net return. The opportunity cost is the accumulated, foregone interest that you’ve paid on debt, or the loss of interest on money that you could have invested if you’d sold your grain earlier. Alberta Agriculture and Forestry has a scenario on its website which explores the costs of storing yellow peas and illustrates how the storage and opportunity costs vary and impact net return to producers. As an example, a producer whose opportunity cost is a bank term deposit may have an opportunity cost of storing grain of three per cent or 0.25 per cent per month. A producer with an operating loan at six per cent interest has an opportunity cost of 0.5 per cent per month. If the producer is carrying credit card or trade debt the opportunity cost could be two per cent per month. You also need to be able to access the grain when you want to deliver it. Can you get to your bins when there’s three feet of snow? “There can be some risk of not being able to easily access the grain at times, so when the prices are good it may be that weather is preventing grain from being moved and that may also apply to the person that’s storing the grain,” says Blue. Delivery availability can also be a factor, as the rail transportation problems during the 2013-14 crop year demonstrated. Backlogs at ports and lack of rail cars meant many farmers that year had bumper crops that they couldn’t deliver when they wanted to. So is grain storage likely to be a good marketing option for this year? We asked Blue to give us a few predictions based on what he has seen going on in the markets so far. “There is still quite an abundance of wheat in the world and wheat tends to be a world market,” says Blue. That would suggest prices could continue to be weak, so producers storing wheat and waiting for a price bump might be waiting a while. But… “On the flip side there has been a relatively strong demand for feed wheat and processing wheat locally on the Prairies with the ethanol plants and feedlot and hog farm usage of wheat has been fairly strong. So that has been a good competitor on the wheat side,” says Blue. So who knows, perhaps that bump might come after all when that livestock gets hungry in the dead of winter? Malt barley acres could be up because of good prices last year, so it’s hard to predict if prices will stay strong if there is a more plentiful supply of malt barley this year — so that might not be quite as good a bet for the bins. “Oilseeds seem to be trying to make a bit of a recovery on price and that’s based on crop uncertainty,” says Blue. “Even though the crops are looking good here and in the US right now, it’s likely, based on the numbers, that we may see a soybean draw down in stocks from a world perspective. So that’s been price supportive, and on the canola side it remains to be seen how many acres were seeded, and if it was as low as the original Stats Canada estimate a few months ago. But the current estimates are that with extremely strong demand both from the export and crushing side, canola prices will be well supported next year.” So that could be one for the bins as long as the crop is dry and cures well so it will store for a few extra months. Regardless of markets, prices and all the other factors that can make storing grain a good or bad option from a marketing standpoint, the fact remains that not all farmers can sell all their production right off the combine — even if they want to. Forty years ago the elevator capacity on the Prairies could take pretty much the whole crop produced, but today it can only handle about 10 per cent. In reality, farmers have little choice but to store more and more grain and bear the capital cost to do so. So if there is some way to turn that to an advantage, by doing some homework and following the market trends, it could be worthwhile to have a few extra bins full for a little longer.